After a brutal first 36 hours of strong headwinds and pounding waves which forced Abu Dhabi Ocean Racing to suspend racing for repairs, the teams now have to reassess their strategies after race control issued new coordinates for the leg’s ice exclusion zone overnight. Ian Walker’s Emirati team turned back to Auckland after tearing out the internal supporting bulkhead for their J4 headsail a few hours into the leg on Sunday. 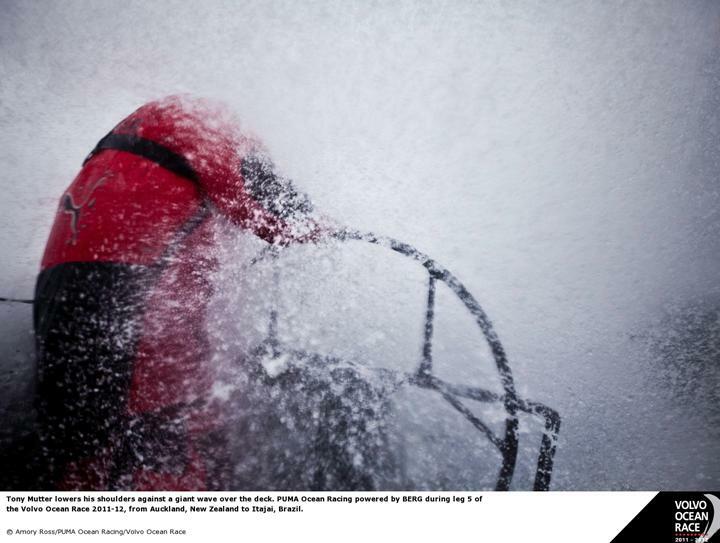 Some speedy work from their shore crew saw them return to sea around 2300 UTC yesterday when they had to shelter for several hours from winds as high as 60 knots before resuming racing at 0725 UTC this morning. Having been the first to breakaway from the pack to the east yesterday, at 1300 UTC today overall race leaders Team Telefónica held an 14 nautical mile (nm) lead over second placed CAMPER with Emirates Team New Zealand. Despite a sail fitting failure overnight which cost them miles, Groupama sailing team lay in third a further 14 nm back and three nautical miles ahead of fourth placed PUMA Ocean Racing powered by BERG. 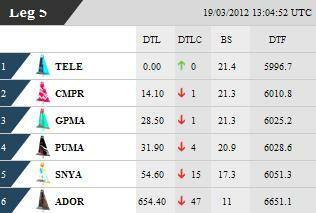 Team Sanya sat in fifth with Abu Dhabi who re-joined the race a few hours earlier trailing them by 600 nm. In Abu Dhabi’s absence the rest of the fleet had endured horrendous conditions heading north against fierce winds from an intense tropical depression before turning to the south east and accelerating to average speeds over 20 knots. CAMPER skipper Chris Nicholson said he was amazed by the punishment the Volvo Open 70s could endure. Nicholson admitted some surprise to have survived the battering unscathed up to this point. “So far we haven’t broken anything which is almost surprising given how hard we have been coming off these waves,” he said. Despite the tough conditions Nicholson said the CAMPER crew had made few concessions and were pushing hard whenever possible despite the almost impossible environment on deck. “There wasn’t too much survival mode, just a little bit of a taste of things to come I think,” he said. 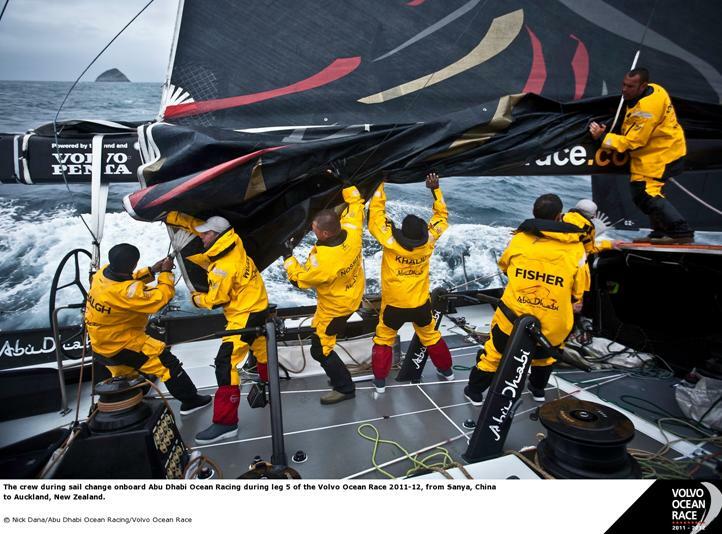 "As soon as we have the right amount of sail area up we are pushing 100 per cent. 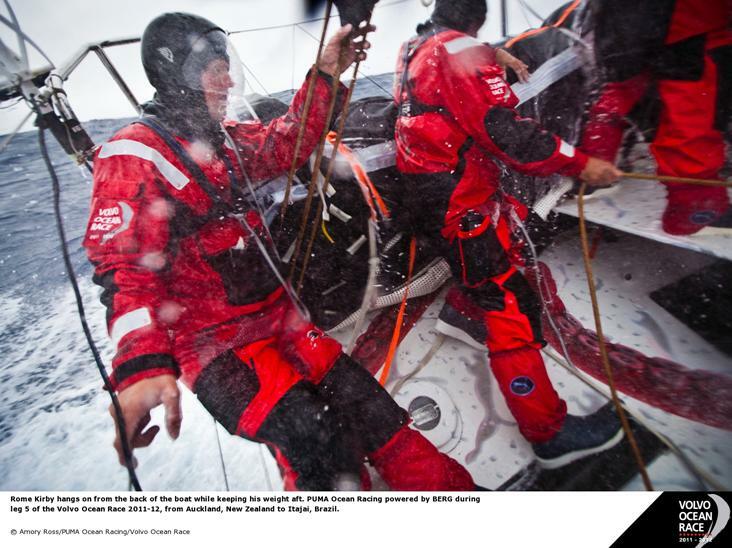 At the moment it’s about 25 knots of wind we have got the hammer down, full on,” he added. "(On deck) you can’t stand up. If you move anywhere you are crawling around on your hands and knees clipped on. Every little job that we take for granted normally is now a bit of a procedure. To ensure the boats are kept clear of the risk of ice on Leg 5 race organisers are using satellite imaging to monitor fleet’s likely path and when necessary adjust the position of the waypoints which define the ice exclusion zone. Overnight satellite images revealed possible iceberg ‘targets’ outside the exclusion zone and accordingly shifted a waypoint north. 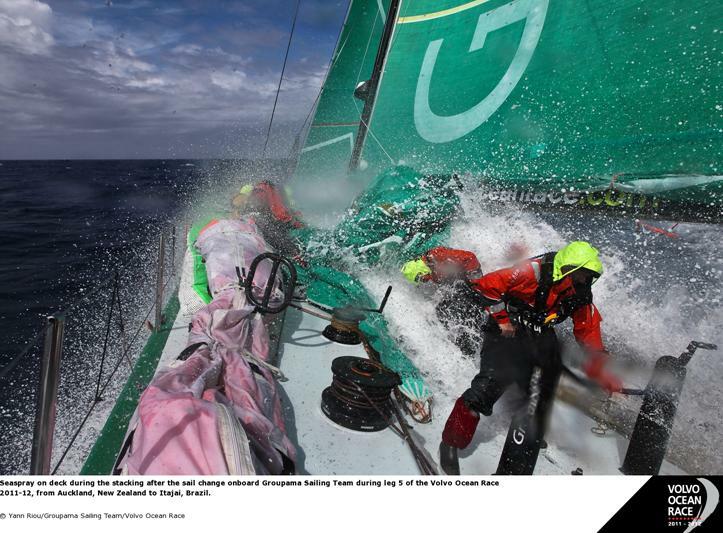 This altered the distance to finish calculation for the fleet but did not affect the leg standings. However, CAMPER navigator Will Oxley said the announcement, immediately communicated to the fleet by email, could change the leg strategy significantly. "Unfortunately they have moved the ice gates north by 120 miles, we just got that email,” he said. "That changes things quite a lot. "The high pressure is around that latitude so the whole leg is much different –much lighter and more headwinds. Commenting on the move yesterday which propelled Team Telefónica into the lead ahead of CAMPER Chris Nicholson acknowledged the overall race leaders currently had a speed advantage. Nicholson said he believed the CAMPER boat and crew would excel when the fleet dive south into the storm track of the Southern Ocean. "For me we can’t get there soon enough but we have got to get the weather to play ball though so it’s going to be about three days,” he said. “We have a little ridge we have to cross first.